A reminder on the cusp of a perhaps grave and auspicious day. 85 years ago, they were a silly and disregarded minority. People chuckled at the circus antics, the self-infatuation, narcissism, and obscenely transparent self-glorification. The beset people who first joined on to the Nationalsozialistische Deutsche Arbeiterpartei (NSDAP) believed in a united country, promotion of nativist values, and the expulsion of minority populations who posed a perceived threat. But for years, the vast majority of the country paid little attention. Initially these small crowds of cheering admirers were nobodies. Routinely arrested for civic disturbances, laughed at for their absurd fanaticism, they would amount to nothing. 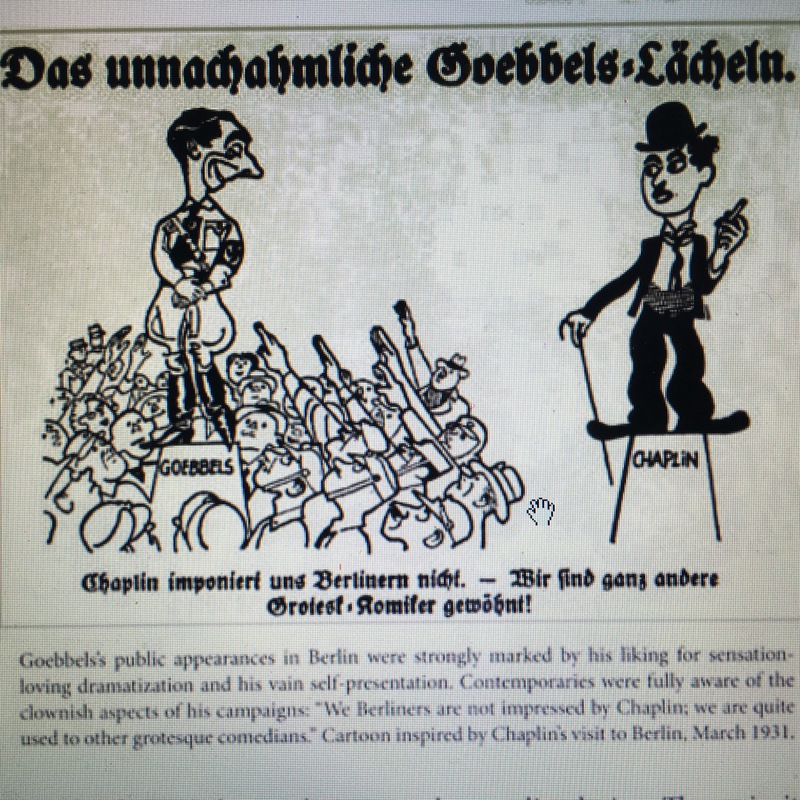 And then Goebbels discovered that spectacles and calls to violence brought them attention. And the attention brought them more crowds. And the crowds brought them power. And then one day, that silly minority became a grudging, then an accepting, and then an excited plurality. More respectable ones joined because it would help them get what they wanted. And it would help them retain power. They couldn’t stop it. And so they joined it. And then no one was laughing any more. This entry was posted in Uncategorized and tagged Charlie Chaplin, Josef Goebbels, Nazi Party, Super Tuesday, Trump by Andrew Lewis. Bookmark the permalink.